A full-body massages – soft music, low lighting, a feeling of tranquility, it’s bliss. But what most people don’t know is that while you might be in a state of total relaxation your body is going into full activation mode during a massage. A massage stimulates your nervous system; wakes up your muscles, organs, and glands; moves blood and lymph fluid, and gets multitudes of cells to produce and release chemicals and hormones. Your body needs a massage to renew itself and reverse the effects of stress. It reduces stress and anxiety: when the body is under stress, it releases cortisol, a stress hormone which contributes to weight gain, sleeplessness, digestive problems, and headaches. Massage therapy decreases cortisol levels in the body. It is relaxing: Prolonged massage therapy boosts energy levels, reduces pain, and stimulates individuals on physical and emotional levels. It helps lower blood pressure: studies have shown that consistent massage program can reduce systolic and diastolic blood pressure. It also reduces trigger sources for tension, anxiety, hostility, and depression. Controlled blood pressure levels reduce the risk of heart attack, stroke, and/or kidney failure, and many other health issues. It improves posture: People experience back, neck, and muscle pain due to many reasons, mostly bad posture. Chronic back pain is the result of incorrect or poor posture and obesity or overweight. Massage therapy under a trained massage therapist gets the body back into proper alignment. It strengthens the body’s immune system: Individuals with high levels of stress are more vulnerable to illness and injury. Stress combined with sleep disturbances and poor nutrition has a direct impact on the body’s immune system. Regular massage sessions reduce stress and boost the immune system’s cytotoxic capacity to keep the immune system strong and resilient. Now that you understand more about the many health benefits of massage, it is important to make time for this useful practice in your busy lifestyle. Keep in mind that a lot of the stress, tension and pain that you feel from being on the go all the time will diminish after each massage. It is also wise to remember that putting your health first is the best way to live a long and happy life. 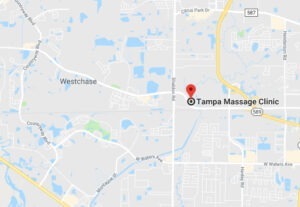 At the Tampa Massage Clinic, located in Tampa, Florida, nothing is more important than human touch. To schedule an appointment with Licensed Massage Therapist and Certified Pediatric Massage Instructor, Jakki Bosco LMT, please call (813) 298-5603. Serving patients in and around greater Tampa Bay, Town N Country, Clearwater, St. Pete, Carrollwood, East Lake, Westchase, Land O Lakes, Wesley Chapel, Lutz, University of South Florida, Brandon, Oldsmar, Safety Harbor, Palm Harbor, Tarpon Springs, Dundin, Hillsborough County, and Pasco County Florida.